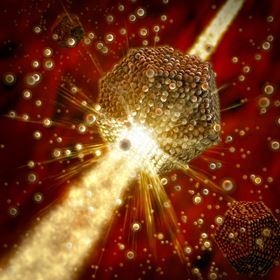 This illustration shows nanocrystals assembling into ordered 'superlattices' – a process that a SLAC/Stanford team was able to observe in real time with X-rays from the Stanford Synchrotron Radiation Lightsource. Image: Greg Stewart/SLAC National Accelerator Laboratory. Some of the world's tiniest crystals are known as ‘artificial atoms’ because they can organize themselves into structures that look like molecules, including ‘superlattices’ that are potential building blocks for novel materials. Now, scientists from the US Department of Energy's SLAC National Accelerator Laboratory and Stanford University have made the first observation of these nanocrystals rapidly forming superlattices while they are themselves still growing. What they learn will help scientists fine-tune the assembly process and adapt it to make new types of materials for magnetic storage, solar cells, optoelectronics and catalysts. The key to this development was the serendipitous discovery that superlattices can form superfast – in seconds rather than the usual hours or days – during the routine synthesis of nanocrystals. The scientists used a powerful beam of X-rays at SLAC's Stanford Synchrotron Radiation Lightsource (SSRL) to observe the growth of nanocrystals and the rapid formation of superlattices in real time. A paper describing the research, which was done in collaboration with scientists at the DOE's Argonne National Laboratory, is published in Nature. Scientists have been making nanocrystals in the lab since the 1980s. Because of their tiny size – they're billionths of a meter wide and contain just 100 to 10,000 atoms apiece – they are governed by the laws of quantum mechanics, and this gives them interesting properties that can be changed by varying their size, shape and composition. For instance, spherical nanocrystals known as quantum dots, which are made of semiconducting materials, glow in colors that depend on their size; they are used in biological imaging and most recently in high-definition TV displays. In the early 1990s, researchers started using nanocrystals to build superlattices, which have the ordered structure of regular crystals, but with small particles in place of individual atoms. These, too, are expected to have unusual properties that are more than the sum of their parts. But until now, superlattices have been grown slowly at low temperatures, sometimes taking days. That changed in February 2016, when Stanford postdoctoral researcher Liheng Wu serendipitously discovered that the process can occur much faster than scientists had thought. He was trying to make nanocrystals of palladium – a silvery metal that's used to promote chemical reactions in catalytic converters and many industrial processes – by heating a solution containing palladium atoms to more than 230°C. The goal was to understand how these tiny particles form, so their size and other properties could be more easily adjusted. "It's kind of like cooking," Cargnello explained. "The reaction chamber is like a pan. We add a solvent, which is like the frying oil; the main ingredients for the nanocrystals, such as palladium; and condiments, which in this case are surfactant compounds that tune the reaction conditions so you can control the size and composition of the particles. Once you add everything to the pan, you heat it up and fry your stuff." Wu and Stanford graduate student Joshua Willis expected to see the characteristic pattern made by X-rays scattering off the tiny particles, but they saw a completely different pattern instead. "So something weird is happening," they texted their advisor. The something weird was that the palladium nanocrystals were assembling into superlattices. "The challenge was to understand what brings the particles together and attracts them to each other but not too strongly, so they have room to wiggle around and settle into an ordered position," said Jian Qin, an assistant professor of chemical engineering at Stanford who performed theoretical calculations to better understand the self-assembly process. This helped to reveal that, once the nanocrystals form, they seem to acquire a sort of hairy coating of surfactant molecules. The nanocrystals glom together, attracted by weak forces between their cores, and then a finely tuned balance of attractive and repulsive forces between the dangling surfactant molecules holds them in just the right configuration for the superlattice to grow. To the scientists' surprise, the individual nanocrystals then kept on growing, along with the superlattices, until all the chemical ingredients in the solution were used up, and this unexpected added growth made the material swell. The researchers said they think this occurs in a wide range of nanocrystal systems, but had never been seen because there was no way to observe it in real time before the team's experiments at SSRL. "Once we understood this system, we realized this process may be more general than we initially thought," Wu said. "We have demonstrated that it's not only limited to metals, but it can also be extended to semiconducting materials and very likely to a much larger set of materials." This story is adapted from material from SLAC National Accelerator Laboratory, with editorial changes made by Materials Today. The views expressed in this article do not necessarily represent those of Elsevier. Link to original source. Scientists have enhanced the catalytic activity of plasmonic nanoparticles by finding a way to encapsulate them in a metal-organic framework.